Crouched in the vine-tangled forest of Borneo, where the brightest part of the day seems like dusk, Elis Tambing finally got the elusive animal in his laser sight and fired. The pink-quilled dart found its mark: the rump of the female pygmy elephant, a unique and endangered animal found only in Malaysia's Sabah state on Borneo Island. Two more shots and the gentle giant, nicknamed Taliwas after the forest where she lives, dozed off standing up, tranquilized for half an hour, ready to be electronically tagged. Thus began, a week ago, a landmark project by WWF, the international conservation group, to track several herds of pygmy elephants for an exhaustive study of a mysterious pachyderm. The tag, a gray, brick-like device strapped around the elephant's neck, will transmit its whereabouts to a satellite three times a day for 18 months until the battery runs out. It will be replaced as often as necessary over the course of the five-year project. 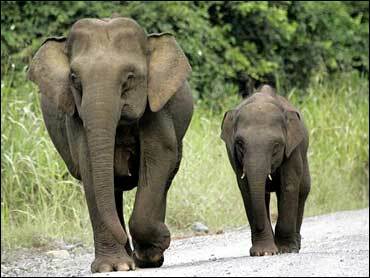 A link on WWF's Web site will give the daily position of each collared elephant. "It will be like having a window seat into the life of the Borneo elephant," said A. Christy Williams, the coordinator for the program for the organization also known as World Wildlife Fund. Pygmy elephants were long considered the same as Asian elephants. A myth held that they were remnants of a domesticated herd given as a gift by the British to a Borneo sultan in the 17th century. They were not considered a conservation priority until a chance DNA analysis by WWF and Columbia University in 2003 revealed them to be a genetically distinct subspecies. "We still know very little about pygmy elephants. Any new information we get will be landmark evidence," said Williams. What is known so far is that adult pygmy elephants stand up to 8 feet tall — a foot or two shorter than mainland Asian elephants; that they are more rotund and have smaller, babyish faces; that their tails are longer, reaching almost to the ground; and that they are less aggressive than their Asian counterparts, almost docile. What scientists don't know is the size of their turf, breeding cycles, eating habits, family size, their movement patterns or even their population, currently estimated to be 1,500 though Williams believes it could be under 1,000. "You would have thought that such a big animal would have been studied to death. But no. Nothing," he said. Williams led the collaring of the first three elephants. A total of six are to be tagged by the end of July. An Associated Press team accompanied the first expedition. WWF says the project is aimed at protecting the species as its habitat comes under pressure from spreading palm oil plantations, which account for 40 percent of Sabah state's GDP. Pygmy elephants love palm oil fruit and will often invade plantations. "Growing palm oil trees next to a forest is like dangling candy before a child. The elephants can't resist it," said Jan Vertefeuille of WWF-USA who was part of the collaring team. Earlier this year, a female elephant's head was found floating in a river. Wildlife experts believe the animal was killed by villagers for the meat. WWF is focusing its project on Danum Valley, a commercial logging forest and one of three areas where the elephants roam. It says the elephants of Danum appear to have adapted to the logging, avoiding areas where trees are being felled. It hopes its study will gather enough data to persuade the state government not to let palm oil plantations encroach on the valley. "In Sabah, we are at a point where if you have proper planning you can show how conservation can benefit both humans and animals," said Williams. But collaring the elephants isn't easy; they melt into the foliage like ghosts, scared off by the slightest sound. "It is very difficult to catch the elephants," said Tambing, a Sabah Wildlife Department ranger, resting after a four-hour hunt that led to the darting of Taliwas in leech-infested knee-deep swamp. "You need to be very fit to trek though that," he said, pulling out blood-engorged leeches from his arm, neck and armpits. "And you need to be very, very quiet when you approach the elephants." Collars are routinely fitted on animals including Asian and African elephants for conservation studies and are not known to cause discomfort. As Taliwas recovered from the tranquilizer, she shook her head, uttered a deep growl and walked off into the forest, seemingly unbothered by her high-tech necklace.